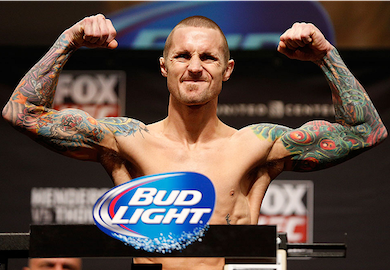 #4 Eddie Wineland made his return to the octagon tonight for the first time since losing to Renan Barao at UFC 165 in September 2013. Despite his losing effort against Barao, Wineland stuck to his regular stance of keeping his hands low relying on his head movement to keep him ahead of Jabouin’s strikes. Wineland showed that he deserves to stay in the mix for the championship after his dominant performance against Jabouin tonight. After a close first round, Wineland started to look confident with his striking and started to open up on his offense. He dropped Jabouin with a brutal right hand and jumped into full mount. He was working on an arm-triangle, but quickly abandoned it and decided to introduce his fists and elbows to the face of Jabouin. Yves Jabouin took too much punishment and his defense was simply to turtle up. The referee called a stop to the fight and Wineland walked back to his corner with his hands raised.